Unlike the shorter string bean, this bean has a soft texture that is flexible and not as crisp or moist as the Western variety. 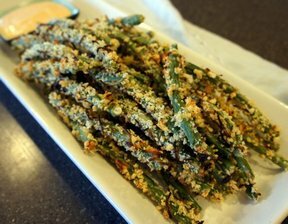 The lighter green bean has a limp texture that is sweeter tasting than the darker variety when cooked. The lighter colored bean is often used for food dishes that can be quickly prepared and cooked. The dark green bean is more tender than the light green variety and is best used in dishes requiring a firmer texture to be retained for longer cooking times or slow cooking, such as recipes for stir-fried, braised foods or stews. When used in stir-fries, braised, sautéed, or other dishes, the beans should be cut into smaller lengths of approximately 3 to 6 inches. 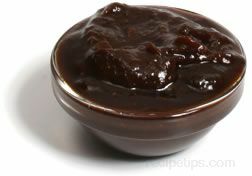 Be cautious not to overcook the beans as they become soft and mushy when cooked longer than necessary. Cooking for approximately 5 minutes is most often sufficient, however, they can be added to stews or soups to cook for 15 to 20 minutes, allowing them to adequately aborb surrounding juices. Blanching the beans works well to bring out the flavor in the bean, as does any type of frying. When selecting, choose smaller or younger beans that have a lighter shade of green and are more flexible, providing a tender, meatier and sweeter tasting bean. Do not select beans that appear dry, rust spotted, yellowed, or too limp in texture. Older beans having a more mature pea within, become tough and oily if they have grown to mature or large. Since the beans do not store well for more than several days, keep them refrigerated, but in the least coolest section within the refrigerator. For serving, match the beans to foods with rich flavors, such as sausages, meats, poultry, fish, spicy peppers, and rich sauces that enhance the flavors provided. 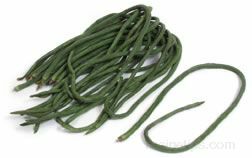 This bean is also referred to as asparagus bean, asparagus pea, Chinese pea, snake bean, boonchi, dau gok, or yard long beans.